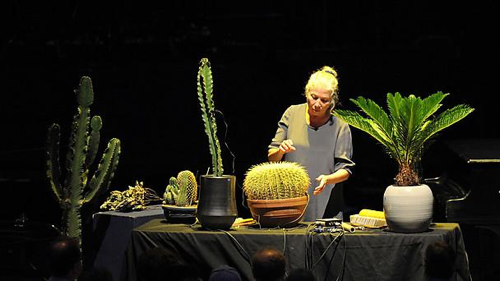 The highlight of the Prom dedicated to Cage was “Branches”, for amplified cactuses and plants. This sounds like a joke, and like much of Cage’s work, it is indeed intentionally playful, and probably as much performance art as music. 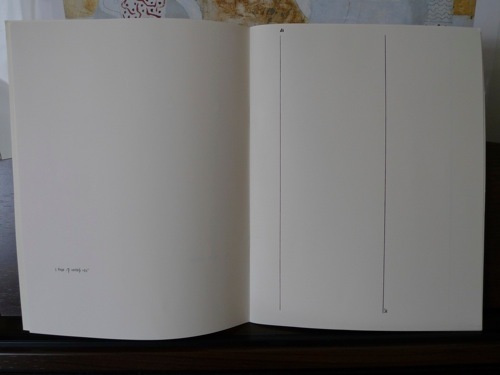 The players were scattered around the Albert Hall, on stage, in the central pit, in boxes among the audience, and their succulents, leaves and water bowls were set with high-gain microphones, and arranged by consultation with the I Ching, one of Cage’s favourite ways of introducing randomness into his works. The result was beautiful, and silly, and I’ll never look at a spiny cactus the same way again. So now, any classical concert that doesn’t feature a smattering of plant life will feel somewhat staid, but nonetheless I am headed back tonight for John Adams’ opera “Nixon in China”. I’ve managed to see a couple of his other operas, The Death of Klinghoffer and Doctor Atomic, over the last few years, and this was his first. This semi-staged version will be conducted by Adams himself — what it lacks in sets and costumes will perhaps be made up for in other sorts of excitement. But probably not in plants. 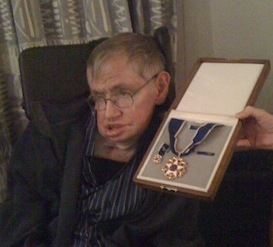 I have been lucky enough to meet Stephen, and was even invited to a dinner party at his house, where I got to see him posing with his Presidential Medal of Freedom, awarded by Barack Obama in 2009. So I was especially disappointed to subsequently hear that he was too ill to actually attend his conference in Cambridge. I wish him a very Happy Birthday and a speedy recovery. It’s not hard to talk about Hawking: he’s been involved with some truly exciting breakthroughs in theoretical physics over the last few decades, perhaps most importantly for teasing out the relationship between the properties of black holes and the laws of thermodynamics. This seemingly formal analogy was realized to be much more than that with Hawking’s discovery that black holes are not, in fact, “black” — rather, they glow at a temperature inversely proportional to the mass of the black hole, emitting what has come to be called Hawking Radiation. These are very significant discoveries, teaching us something crucial about the connections between the three great theories of physics, quantum mechanics, gravity and thermodynamics. But it’s safe to say that no one yet fully understands exactly what those relationships are. And of course Hawking’s nonscientific accomplishments are well-known and justly valorised. He has lived with — triumphed over — ALS for far longer than any of his doctors had predicted. He has written one of the best-selling popular science books of all time, A Brief History of Time. And, needless to say, he’s done some amazing scientific work, just some of which I’ve mentioned above. 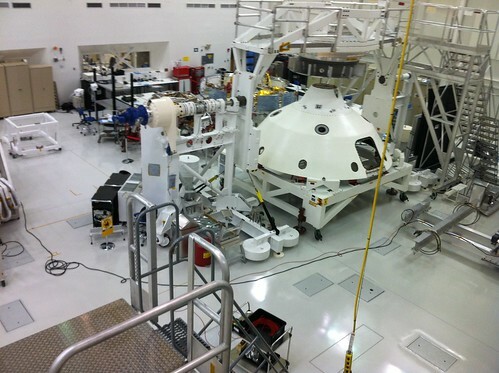 Saturday afternoon I received a call from a news producer at the BBC — could I come talk about the Mars Science Laboratory, launched earlier that day? This was a tough question, publicity-monger though I am: I don’t actually know anything about Mars. I suppose to people outside of the very broad field of “astronomy”, studying the planets in the solar system is not very different from studying the Cosmic Microwave Background. After all, in both cases we use telescopes and satellites. But actually, the study of planets is much closer to geology (and, with increasing interest in the possibilities of life on those planets, to biology) than astronomy per se. 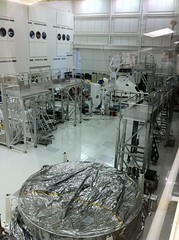 Nonetheless, I did actually know a little about the Mars Science Laboratory and its Curiosity rover: when I was visiting the Jet Propulsion Laboratory earlier this year (to work on the CMB), our group took a quick field trip across the lab to the shop where the satellite was being assembled. Everything else I admit that I learned from wikipedia and NASA PR materials in the two hours before the interview. Martians are, of course, one of the most important parts of MSL’s mission and the broader international program of exploring Mars. NASA is very careful to point out, however, that the point of the current mission is not to find life per se, but to help determine Mars’ habitability: could Mars now support life, or could it have in the past? The actual hunt for life will have to wait for a future mission. Despite my almost eight years in Britain as an astronomer, I suppose I have to be embarrassed to admit I’ve never actually watched “The Sky At Night”, apparently the longest-running show on television (possibly in the whole world, not just the UK). But I’m watching this evening’s episode, mostly because I’m on it. I was filmed during last month’s trip to the Planck launch. As always, it was painful to realize the fat figure with the bad posture and annoying voice was actually me. But it was fun to watch Patrick Moore do his studio interviews, with a style and on a set neither of which seem to have changed since the 1970s. But it was beautiful and moving to see the launch again, and to watch the much closer movies and pictures than I was able to get on the day. Since then, parts of Planck have been slowly turned on, cooled down, and checked out. Everything is working well so far; we’re looking forward to the first data in a little more than two months. It’s going to be a long summer. The episode will briefly be available on BBC’s iPlayer, but more of my cringeworthy discussion of Planck in a different context is up on YouTube; check out the next post for much cooler cosmology video from a more photogenic cosmologist with a better voice. BBC4 let us spend a night with my New Jersey homeboy, Bruce Springsteen. Selections from The Seeger Sessions, recorded with a BBC audience at St Luke’s in London, gave us middle-aged Bruce as protest singer, rocking up some folky standards. This may indeed be what the world needs now, but with its whitebread, bespectacled audience, it had a kind of NPR/Garrison Keillor feel (think Andy Kershaw without the hard-rockin’ Peel influence, and worse jokes?). But during the next hour, recorded at the Hammersmith Odeon with the E Street Band in ‘75, when Springsteen started singing “Thunder Road”, it sent chills up my spine. Me, I remember summers listening to “Born To Run” in the late 70s and early 80s, not quite understanding the operatic desperation of Bruce’s characters, but adolescent enough to pretend to it, and just old enough to feel — and young enough to believe in — the salvation of rock ‘n’ roll. For some reason, the BBC's Today Program had a feature on the Big Bang and its purported problems confronting modern data. Apart from the woefully misguided Eric Lerner, the discussion was relatively nuanced and at least attempted to distinguish between a wrong theory and an incomplete one -- the questions that the Big Bang, as it stands today, leaves unanswered. The Big Bang per se is simply the idea that the Universe started out hot and dense and has been expanding ever since. This is borne out in great detail by observations such as the expansion of the Universe itself; by the abundances of the light elements like Hydrogen and Helium which were "cooked" in the heat of the Universe when it was just a few minutes old; and by the Cosmic Microwave Background which I spend much of my time investigating, the so-called afterglow of the Big Bang (see the picture below). The feature also included a brief statement from my colleague Kate Land, who has been working with Joao Magueijo (and neither of whom I seem to be able to point to right now) investigating some of the unexpected patterns we see in the CMB, and whose work may point to yet more refinements to or revisions of the Big Bang. For us experts, the most interesting part of the interview was the statement that we should expect new results from the WMAP satellite in November. WMAP reported its first results back in 2003, and we've been waiting for their analysis of yet more data for the past year and a half or so (meanwhile, experiments like Boomerang have continued to analyze their own CMB data). The Observer also reports on the supposed anti-US bias of the BBC's Katrina reporting, citing a second-hand report from the always fair and balanced tycoon Rupert Murdoch on a conversation with Tony Blair. The PM supposedly referred to the BBC's coverage as "gloating" and "full of hatred of America". Even Bill Clinton seemed to echo these criticisms. I'm not so sure: I was in the US for the entire week of Katrina, and the reporting there was no less angry: angry not at the people of New Orleans, of course, but angry at the government for its slack response, its representatives' willingness to tell bald-faced lies about the state of the poor (in several senses of the term) people in the Superdome, for example. That veneer of supposed objectivity (and of course we must emphasize the "supposed") is rarely cracked in US reporting, but Katrina was one event which actually brought the reporters straight into the story, a stark contrast to the sorry, spoon-fed "embedding" they and we have had to endure of late.